I think we’ve talked a time or two about the importance of weight and balance when flying general aviation aircraft. The simple fact is that virtually no light plane ever manufactured can lift a full load of people as well as a full load of fuel into the sky at the same time. If you want to carry more people, you need to carry less fuel. If you want to carry more fuel, you need to carry fewer people. That’s the weight in weight and balance. The whole balance part of the weight and balance dance is about ensuring that the load is placed in the airplane correctly so that it’s neither too tail-heavy nor too nose-heavy to fly safely. I’ve been doing weight and balance since I was seventeen years old. The military does it too, at least for cargo planes. 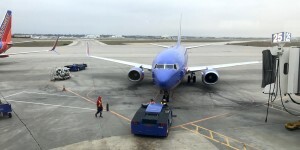 And I’ve watched flight attendants juggle passengers on small commuter planes, but never in a million years would it have occurred to me that it’s an issue for airliners had I not been on a Southwest Airlines flight out of Houston, Texas on Super Bowl Sunday. What? Did I attend the Super Bowl? No. Not my cup of tea. Houston just happened to be where I changed planes heading farther east. But I did enjoy the good-natured ribbing between Falcons and Patriots fans flying into the city. The airplane was a Boeing 737, arguably the most successful airliner since the DC-3. Boeing has been making these short- to medium range twinjets since 1967. Over the intervening years there has been a blizzard of variations, including a military cargo version and a personal jet version, called the BBJ for Boeing Business Jet. Can you imagine owning a one hundred-foot long personal jet with a ramp weight of a hundred and fifty thousand pounds? Boeing has sold over ten thousand of these airliners to operators in 190 countries, according to Wikipedia. Stats there show 737s are operated by more than 500 airlines globally, and apparently, at any second on your wristwatch there are 1,250 of them in the air at the same time. All told, the 737 makes up a quarter of the global fleet of airliners. And apparently it too is incapable of lifting both a full load of fuel and a full load of passengers into the air at once. I know this because after we’d sat—properly buckled in with our belts low across our laps as instructed—at the gate for the longest time, the Captain came on the intercom, and explained that we had, uh… a… you know… a problem. Fuel is cheaper in Houston than it is in New Orleans or Orlando, the plane’s next two stops, he explained, so the airline topped up the tanks with cheap gas while on the ground in Texas. The problem was that the plane’s manifest showed a three-quarters full plane, but then the rest of the seats sold out at the last minute. The plane was now too heavy. Apparently, weight and balance matters to the big boys, too. Just like small planes, airliners aren’t always able to lift full seats and full tanks into the wild blue yonder. The Captain told us that de-fueling takes forever so they decided the simplest solution was two fold. First, some people would need to de-plane. Then the rest of us would fly at lower than usual altitude to New Orleans, which is less fuel-efficient. He reported that by the time we got there this would get us within our max landing weight, which we’d exceed on takeoff. I was surprised and delighted that he gave such a detailed explanation to his passengers. First, the seven standby passengers were given the boot. But Southwest still needed five more passengers to take the next flight. After an offering of a $500 bounty, five hands shot up. Mine wasn’t one of them. I wanted to be on the barnstorming airliner. Typically, 737s fly at 35,000 feet. On this flight we’d be at 12-15,000 feet, according to the Captain. That I had to see. But this really doesn’t sound like a good business practice, does it? To find out, I decided to run the math myself. A 737 can hold 7,837 gallons of Jet-A. I checked the price per gallon for Houston. Of course, my sources don’t show airline discounts, but I could fly in and buy a gallon for $5.50. At that price, if I flew in my personal BBJ—if I was rich enough to own one—and filled it up, I’d spend $43,103.50. Farther east in the Big Easy, sure enough the price jumps to seven bucks a gallon. Now my tank-up costs $54,859.00—nearly $12,000 more. 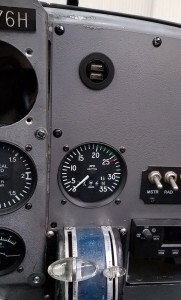 I have such small gas tanks in the Plane Tales Plane that I don’t bother to divert for cheaper fuel, but when you have big tanks to fill, it can really make a difference! As we taxied out to the runway I was still amazed how little difference there is between Ercoupe and Airliner. 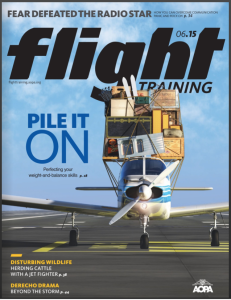 For more about weight and balance, read my article The Weight and Balance Jungle in the June 2015 issue of Flight Training Magazine. Even non-pilots will enjoy it. It has elephants and monkeys. And whiskey. Wicked jets, shark-mouthed warbirds, and… a pink race plane? 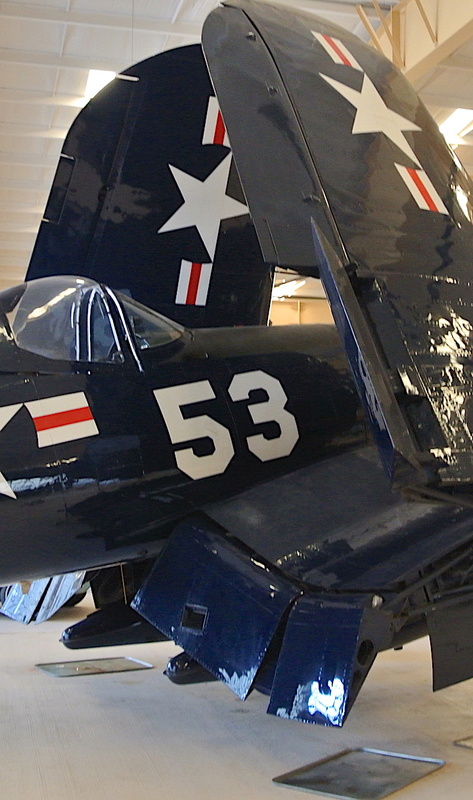 The gull-winged Vaught F4U-4 Corsair of Black Sheep Squadron fame, arguably one of the most beautiful war planes of all time, is painted a deep glossy blue—nearly black. She sits near the hangar door, wings mimicking praying hands, folded upward towards the heavens. The man who taught me my commercial, instrument, and mountain skills—Gil Harris—flew one of these as a Marine pilot in the Pacific during World War II. Every time I see one of the iconic fighter planes I think of him. But now, with the spinner high above my head, I’m struck once again by just how damn big the thing is, especially for a one-man fighter. It’s over 33 feet long from nose to tail. Unfolded, the wings stretch to 41 feet. But most impressively, the top of the engine stands nearly 15 feet off the ground. This one, with her wings reaching upward literally towers over me. And it bears my Race Number: 53. Funny the way the aviation world is so full of connections. 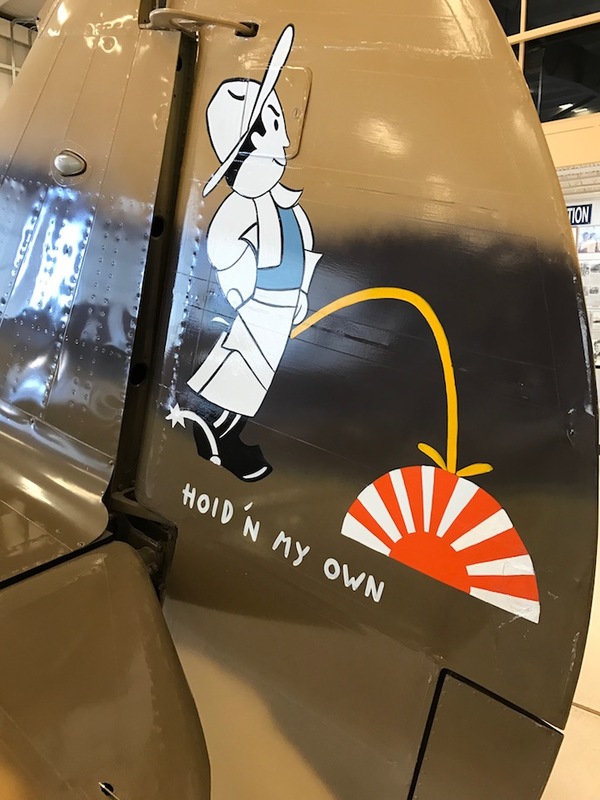 But it’s chilly inside the massive 64,000 square-foot-hangar, so I cut short my communion with the past and its links to the present, and move on to the next exhibit, a rare two-seat P-51 D Mustang named Friendly Ghost. Next on the flight line is a shark-mouthed P-40 Warhawk, the same type the Flying Tigers flew, but this one is in Army Air Force colors. On the tail of the plane, a cowboy is urinating on the Rising Sun. I admire the moxie, but I sure wouldn’t want that on my tail if the Japanese shot me down. I turn, and in the shadow of a gleaming black twin-engine, twin-tailed P-38 Lightning is another old friend. Painted bright, cheerful yellow, a tiny Piper Cub manages to hold it’s own among the massive warbirds. 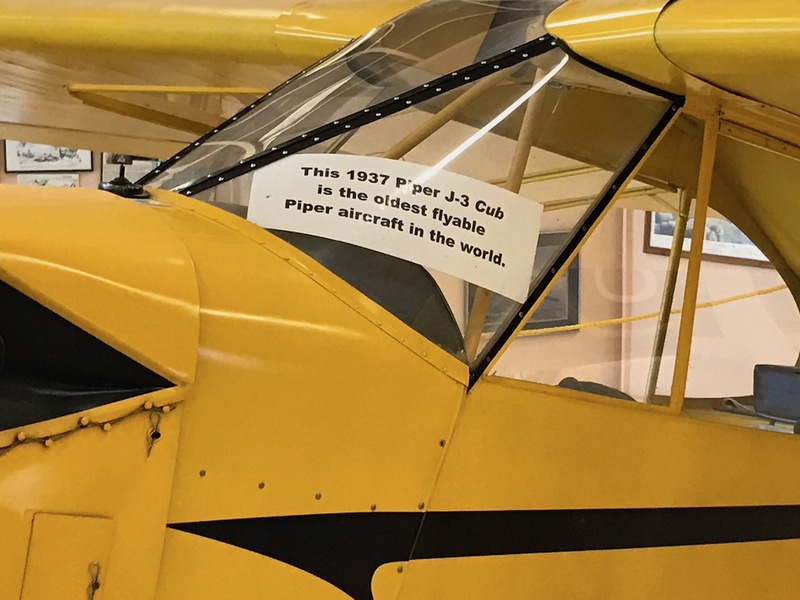 A sign in the windshield says that it’s a 1937 model, and that it’s the oldest flyable Piper airplane in the world. And that’s what makes this museum special. 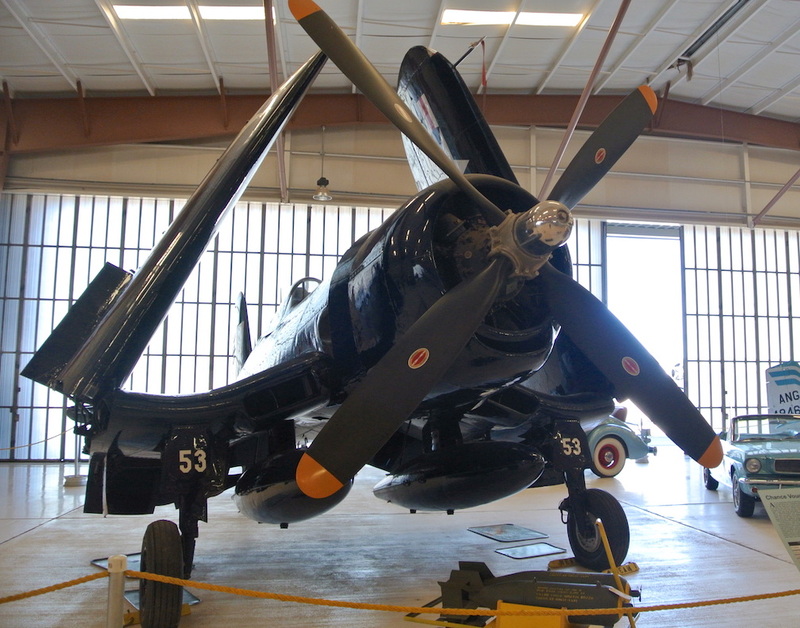 The War Eagles Air Museum prides its self on keeping its collection aloft. Under nearly every one of the thirty-seven planes in their main hangar sits an oil pan. 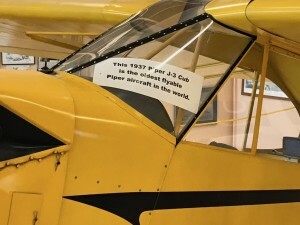 That’s not something you see in most air museums, where former denizens of the air are often shown as “static” displays, permanently grounded, shot and stuffed birds in a natural history diorama. Airplanes are born to fly. I like museums that keep them flying, which is no easy thing to do. It’s much cheaper to park a plane and dust it off once a month than to keep it airworthy. It takes extra dedication to keep a collection aloft. 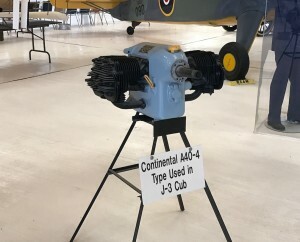 Next to the Cub, on a stand, is a cub engine. A 40-horse Continental A40-4. 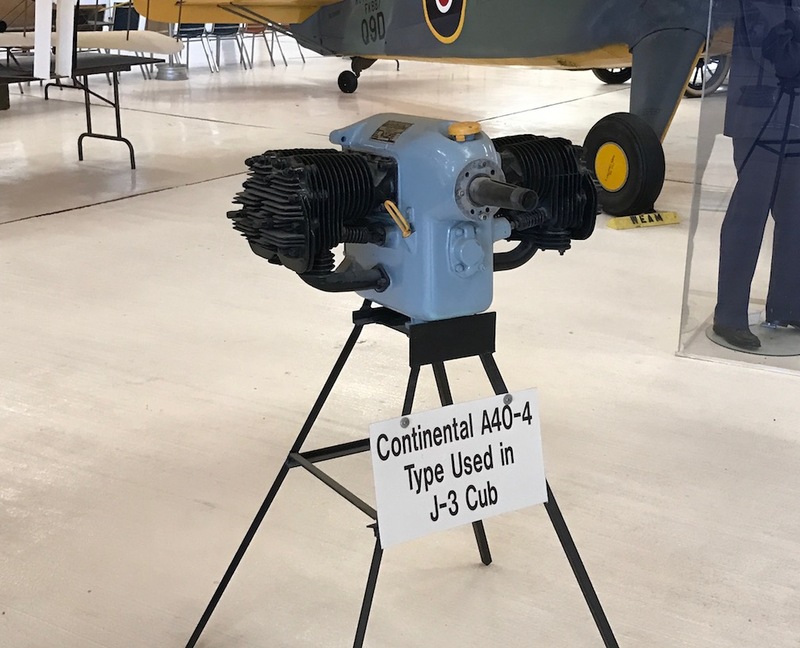 Ridiculously improbable as an aircraft engine, it’s small and simple. 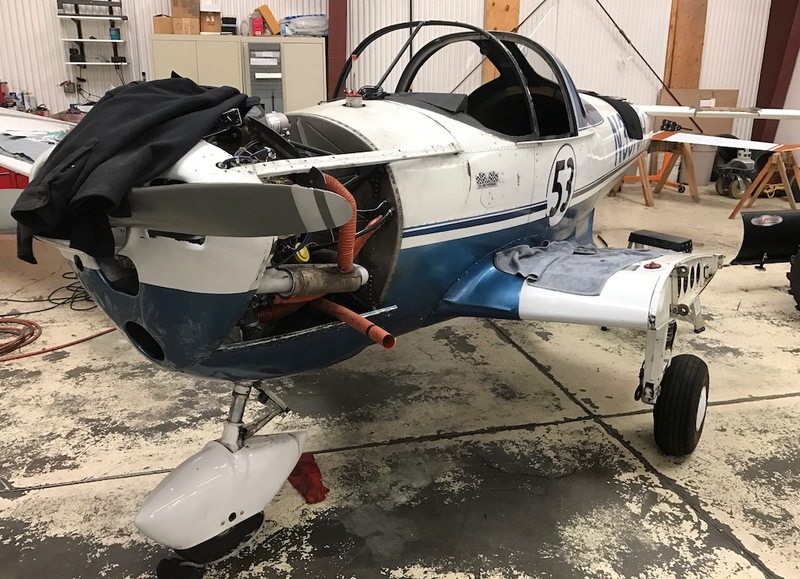 It looks like it belongs in a lawn mower rather than in an airplane. I have a vision of being able to tuck it under my arm and carry it to my mechanic for maintenance (although according to the internet, it weighs 150 pounds, and I’m not that strong). Looking down the isle, it’s airplanes as far as I can see. This world-class museum is in the unlikely location of Santa Teresa, New Mexico, population: 4,258. The village sits 30 miles west of El Paso, Texas, and six miles north of the Mexican border. Santa Teresa is Spanish for Saint Teresa, one of the patron saints of pilots. Like I said, the universe is full of connections. 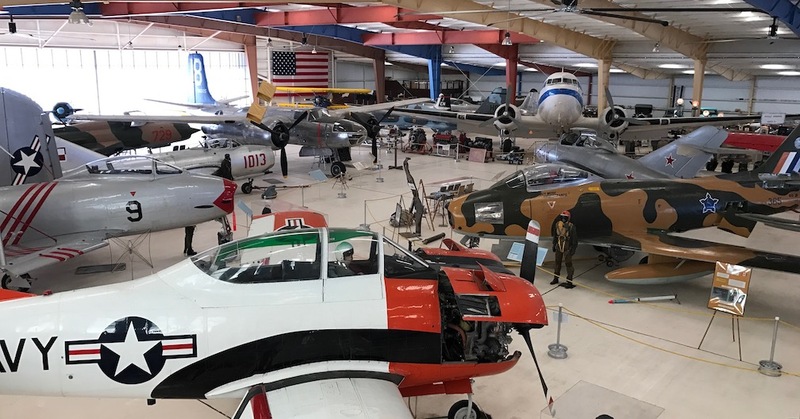 The collection of planes, like that of many airplane museums, is heavy on both military aircraft and World War II aircraft; but there is a handful of biplanes, two helicopters, a number of early fighter jets from the 50s, and a lovely DC-3. The museum is comfortably crowded, unlike the Mid-American Air Museum in Liberal, Kansas, which is uncomfortably crowded. War Eagles also has an interesting array of aviation artifacts—mementos, photos, uniforms, models, and more. 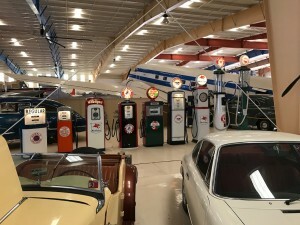 For car lovers, the museum includes a collection automobiles. In fact, they have more autos than airplanes, with more than fifty cars ranging from a 1908 Overland to a 1984 Jaguar, along with a great collection of antique gas pumps. Rounding a corner under the wing of a twin-engine Douglas A-26 light bomber, an unusual airplane catches my eye. 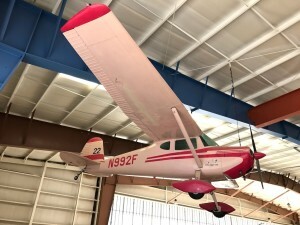 Suspended from the ceiling in one corner is a Cessna 140. And it’s Mary Kay pink. I stop and rub my eyes, then look again. Yep. A lovely shade of pastel pink. Not normally a color you see an airplane painted. Her nose and wheel pants are painted a darker pink, as are her wing tips. She’s also sporting a Race Number: 22. Tickled pink, and I couldn’t wait to learn more about this unusual airplane. Briefly, this is the story of Race 22, a.k.a. the “Cotton Clipper Cutie:” The small Cesena was the First Place winner of the 1954 all-women’s air race. Variously called the Women’s Air Derby, the All-Women’s Transcontinental Air Race, and today known as the Air Race Classic; the press at one time dubbed the long-running women’s cross country air race as the “Powder Puff Derby,” a moniker that different generations of women pilots have alternately either embraced or shunned. The pink plane was piloted by Ruth Deerman and Ruby Hays of El Paso, now both sadly deceased. They were no strangers to the arduous race. They competed in the 1950, 1951, 1953 races without scoring a major victory, but their luck changed in 1954. Flying from Long Beach, CA to Knoxville, TN, with nine intermediate stops, the women covered the nearly 2,000 mile route in five days, clocking an official speed of 123.9 miles an hour for the course, taking the first place slot in the 8th running of the race, and beating out fifty competitors. The Women’s Race is a “handicapped” race, a system that places all the planes in the race on an equal footing. The winner isn’t the plane with the biggest engine; the winner is the plane with the best crew. Winning speed comes from precision flying, smart planning, finding and taking advantage of winds, and apparently, being fast on the ground, too. According to the display, Hays, the copilot/navigator, related that—wearing a dress, nylons, a hat and gloves—she dashed from the plane at one of the checkpoints to get their log stamped and “took a spill” on some loose gravel, sliding right under the table! She called it ignominious. But they won. 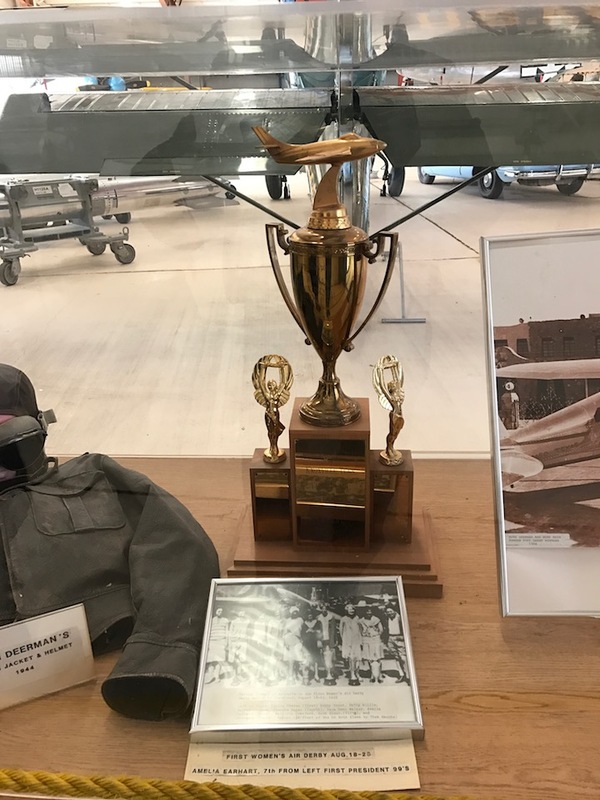 The ladies donated the historic race plane and their trophy to the museum in 1994, along with a collection of memorabilia that includes a great photo of the two women lying on the ground waxing the belly of the plane with Wonder Earth glass wax. So did Race 22 win the derby wearing pink? Sadly, no. She was painted pink in later years. A faded period B&W photo shows the polished silver plane as she looked crossing the finish line. But now in the pink, she’s quite the eye catcher. I haven’t flown in eleven days, and I’m already getting crabby. Last night I nearly kicked one of the cats. It’s not that eleven days is all that long. I often go weeks at a time when I don’t fly. But those dry spells are self-imposed. Right now, on the other hand, I can’t fly because I don’t have an airplane. And to make matters worse, I have no clue when Tess will be back in her hangar. Yes. It’s that time of year again. Tess is in Santa Fe with her mechanics for her annual inspection. As is typical, the mechanics have refused to even speculate on how long this one will take. And I can’t go over and take her up for a stretch of her wings and my soul because at this very moment, her left wing isn’t even attached! The good news is that firewall forward she’s been given a clean bill of health. That means my mechanics started with her engine and made sure everything between me and the spinner is still in good shape after an epic year traveling the country racing. Next comes a long list of “squawks” that need repair. The copilot fuel tank needs to be removed and rebuilt. That’s a biggie. Another biggie is that we’re biting the bullet and installing an ADS-B transponder so we can fly into controlled airspace after January 1, 2020. Her yokes, ailerons, and nose gear are out of alignment. In level flight, the yokes are tilted 12 degrees to the left and her nose gear is crooked, causing drag and uneven wear on the nose tire from landing with it cocked slightly sideways. The pilot’s side door, once again, has broken; and the velts that the two doors slide along have worn to shreds and need to be replaced. The windshield seals have failed again too, so while all that glass is out we’ve decided to change it all to LP Aero UV/Infrared blocking replacements. I’m told that this magic material can drop cockpit temps by as much as 20 degrees. What a blessing that will be, plus we won’t need to use as much sunscreen! One of the wing walks has come loose. The altimeter is wonky, and I’m not convinced the amp meter is working right. The tail is sagging a bit, so more spacers will have to be added to the main landing gear. And now that we have more electrical power than we used to have—thanks to the fact that the generator died last season and was replaced with an alternator—I’ve had my guys add some USB charging ports for all the modern gadgets we fly and travel with. 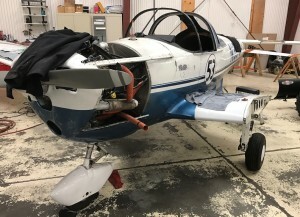 The tie-down loop on the tail needed to be replaced. The cabin heat hose is in the way of the oil dipstick on the new exhaust. And so on, and so forth. There’s nothing I can do but wait and let nature—and the mechanics— take its/their course. It’s an annul ritual, and at least the enforced flying break makes me that much more grateful that the rest of the year I can drive to the airport and fly anytime I want. In the meantime, however, I guess there’s nothing to do but go make up with the cat.